1 of 3 Heat oven to 375 degrees. Seed and dice 1 of the cooked peppers. Slice remaining 6 peppers from stem to bottom; seed. 2 of 3 In a medium lidded pot, bring 2 cups water to a boil. Stir in quinoa; return to a boil. Cover, reduce to medium-low and cook 10 minutes. (If using another brand of quinoa, cook 2/3 time shown on package.) Drain; set aside. 3 of 3 Return pot to stove; place over medium heat. Add olive oil. Stir in the 1 diced pepper and onion. Cook 5 minutes. Mix in cumin and cinnamon; cook 1 more minute. Stir in figs, cashews, quinoa, salt and pepper. 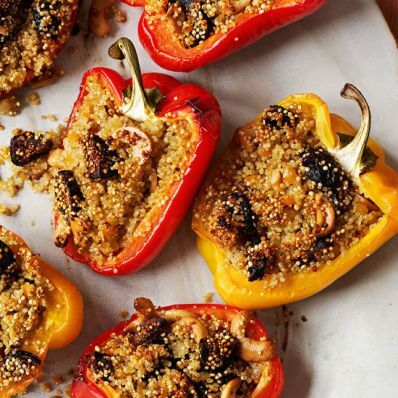 Fill pepper halves with quinoa mixture and place cut-side up in a 9 x 13-inch baking dish. Cover with foil and bake at 375 degrees for 25 minutes. Remove foil and bake another 30 minutes or until peppers are tender.